7th August 1968-Only seven years after the Betty and Barney Hill abduction, the New England states would again host an alien abduction. Buff Ledge Camp in Vermont would be the site of a visitation by four UFOs which would appear, make revolutionary aerial maneuvers, and alter the lives of at least two young people. Buff Ledge was a girls camp located north of Burlington on Lake Champlain. During their tenure as summer camp employees, Michael Lapp, a sixteen year old maintenance man, and 19 year old water ski instructor Janet Cornell were relaxing at a boat dock on a slack day. On this particular August afternoon, the swim team had a made a trip to Burlington to compete in a meet, and the camp was virtually deserted. Late in the afternoon, the two friends were enjoying the view of the sun setting over the water, when a bright light appeared in the darkening sky. At first, Michael thought they were being treated to a beautiful, close up view of the planet Venus. All of a sudden, the glowing light began to move downward, and ever closer to Michael and Janet. The object, at first a round glow, now began to flatten out as it came even closer. Michael shouted, "Wow! Venus is falling." As the two steadfastly watched the light, three smaller lights seemed to drop from the larger one, which quickly moved up and disappeared from sight. The three smaller objects began to move over the lake. They were obviously under intelligent control. The objects put on a show for Michael and Janet, doing zigzag maneuvers, loops, and then descended like falling leaves. The three objects now moved even closer to the two baffled teenagers. After forming a triangle, two of the objects pulled back. Michael would later recall a sound "like a thousand tuning forks" when the two left the third craft alone. The one remaining UFO passed over Michael and Janet, then shot upward and momentarily disappeared. It very soon reappeared, tilted to one side, and dropped into the lake. A couple of minutes seemed to pass before the object reemerged from the water, and began gliding straight toward them! 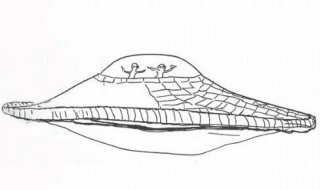 The object was now close enough to see a transparent dome occupied by two childlike creatures. Michael would describe the beings as having elongated necks, big heads, and no hair. Their eyes were also large, and extended around the side of their heads. Michael began to sense a kind of mental communication with the two beings. Watching them intently, Michael slapped his knee, and to his surprise, one of the occupants mimicked his movement. The craft now moved directly overhead, and shot a beam at Michael and Janet. Grabbing Janet's shoulder, Michael pulled both of them on their backs on the dock. Suddenly, Michael was overcome with the fear of being kidnapped. He remembers screaming, "We don't want to go!" The light from the beam was so bright that Michael recalls being able to see the bones in his hand, like an X-ray. The two teenagers both later related that the beam had a "liquid" feeling to it, and gave them the sense of free floating. Their next conscious thoughts would be that of staring at the object again from the dock. The sky was now totally black, and Michael wondered how long he had been in this one spot. Looking at Janet, he could see that she was in a trancelike state; drowsy and disoriented. They now heard the welcome sounds of the swim team returning from their meet in Burlington. The UFO now moved upward into the black sky, flashed its light beam repeatedly, and then vanished from sight. Strangely, Michael and Janet did not discuss what had happened to them, not now, and not for the next couple of weeks, when camp season ended. Maybe the strange things they had seen over the lake this evening were just optical illusions. Maybe they weren't. After their summer camp jobs were over, Michael and Janet went their separate ways. During the next five years, Michael rarely thought about that night. But in time, he began to have disturbing dreams...dreams about being kidnapped; abducted...against his will. The dreams would come... like they did... then the dreams would vanish...like they did. It would be ten years after his harrowing experience that Michael made a decision to contact the Center for UFO Studies, and search for answers. Investigator Walter Webb was assigned to the case, and after hearing Michael's story, suggested regressive hypnosis to help rid him of his emotional strife and the frightening dreams. During Michael's hypnosis, he vividly recalled his experiences on that night in August 1968. He remembered how the beam of light lifted him into the crafts interior; how he entered a bigger craft, and how he saw Janet lying on a table being examined. The small beings shined a light into her eyes, scraped her skin, and took fluids from her body. 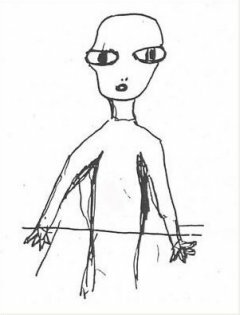 "The aliens all looked alike, Michael recalled, and had those large eyes, a mouth without lips, no ears, and two small openings for a nose." Michael also described the beings as having three pointed, web-like digits for fingers, and their bodies felt "damp and clammy." The aliens related to Michael that their mission was to "make life like ours... other places." Janet also underwent the regression, and her descriptions only went to verify Michael's. She recalled feeling "cold" on the examining table, with something "pulling her hair and pinching her neck." The abduction of Michael Lapp and Janet Cornell certainly falls within the general pattern of abductions reported by many others. 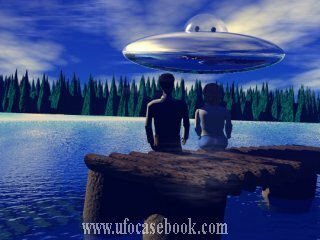 To confirm the facts of their fantastic story, Webb located several other members of the camp who had witnessed the strange lights over Lake Champlain the very night of the abduction! Two other employees reported a similar experience which had occurred earlier that same summer, when they observed unidentified flying objects hovering over the lake for about twenty minutes. Although Michael and Janet's experience was not reported for ten years after the fact, it is still a well documented case of alien abduction.